Antenna Magus is a software tool for the acceleration of the antenna design and modeling process. Validated antenna models can be exported to CST Studio Suite® from a huge antenna database of over 350 antennas. Antenna Magus has proven to be an invaluable aid to antenna design engineers and to anyone who requires antenna models for antenna placement and/or electromagnetic interference studies. An engineer can make a more informed choice of antenna element, providing a good starting design and thus increasing efficiency. Whether starting with a new design or updating an existing system, most antenna engineers will start with an antenna element that is well known. Antenna Magus makes it easy to explore alternative options. In many cases it is only after the attempt to adapt and optimize an existing antenna element has failed to meet the new specifications that the engineer will start to consider other elements. Often, one of the first elements considered becomes the de facto choice, simply because too much time has been expended on the element choice and the “cost” to start over with a new element is too high. 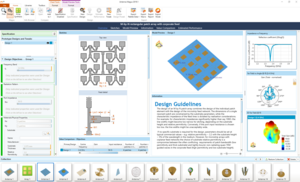 To meet the need for rapid assessment of many antenna elements, antenna information in Antenna Magus is structured in a standardized format, making it easy to compare different elements. Unlike most literature, Antenna Magus highlights unique and general characteristics of each antenna which makes it easy to compare antennas with each other and, more importantly, to compare them with the given requirements. When designing an antenna for the first time, there are some elementary steps that need to be completed before continuing with the distinctive (non-standard) part of the design process. If you know where to start the design process, the elementary steps should be trivial, but often the starting point is not that well defined. Published papers or books may have insufficient information to reproduce reference designs and often good reference results aren’t available. This means that days are spent manually optimizing a basic antenna structure in an attempt to get the general performance within specification. Antenna Magus takes care of this (sometimes tedious) exercise by offering reliable first order designs that have been validated against reference data. Each antenna is thoroughly researched and design algorithms undergo various tests and validation routines to confirm that they work properly for a wide range of goal combinations. Antennas can be designed for specific objectives like gain, bandwidth and impedance at the push of a button. The “Estimate performance” feature enables quick analysis of the designed antenna to give an indication whether an element is a suitable candidate for the final design. Because the topology and the environment of the antenna are known, Antenna Magus can make certain approximations which can speed up analysis time while still giving reasonable estimated performance results. The export functionality in Antenna Magus allows more time to be spent on antenna design and less time on mastering simulation software. Novel concepts and design ideas can be tested quickly. Starting from “ready to run” parametric simulation models exported from Antenna Magus, users can leverage the capabilities offered by the supported 3D electromagnetic (EM) simulation tools more effectively. Models can also be combined to realize new topologies rapidly. Before Antenna Magus, there was no information management system designed specifically for antenna engineers. This resulted in critical information being stored in stacks of papers, on CDs/DVDs or physical prototypes somewhere in a dusty store room. This knowledge represents years of experience and work – but was not very accessible or sharable. While creating Antenna Magus, it was necessary to make a knowledge management system to manage all of this information in a consistent manner. 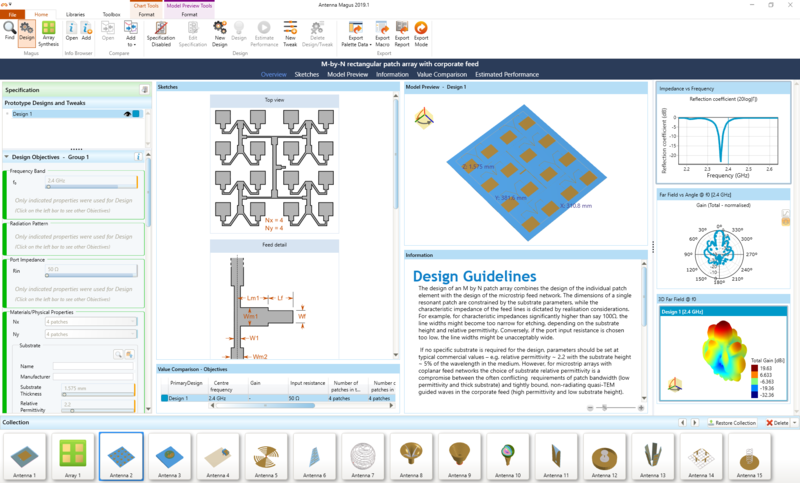 This feature provides engineers with a framework to store information like documents, sketches, design algorithms, measured data and models in a logical, accessible way. The framework of the knowledge management system is consistent for all antennas in the database which makes it easy to find information and compare different antennas. As more knowledge of a specific antenna is gained, the information can easily be extended and improved. Once the information has been captured, it can easily (and securely) be shared among colleagues or friends.